The most basic combustion control scheme is a “Jackshaft” control. Jackshaft position is a single actuator that adjusts a jackshaft based on the demand of the master control output. The fuel and air devices are connected to the jackshaft by a series of cams and linkages. When the jackshaft moves, it moves the fuel valve and air damper to set the fuel/air ratio at various loads. The system is set up during the commissioning of the burner at various firing rates by setting the set screws on the fuel valve and linkage adjustments on the air damper. This achieves desirable excess air levels. Jackshaft controls are inherently safe because the fuel and air are mechanically linked together. This decreases the likelihood of a problem occurring with mechanical failure significantly. Jackshaft controls have Limitations with firing different fuels because only one fuel can be fired at one time and only one fuel can be set optimally. 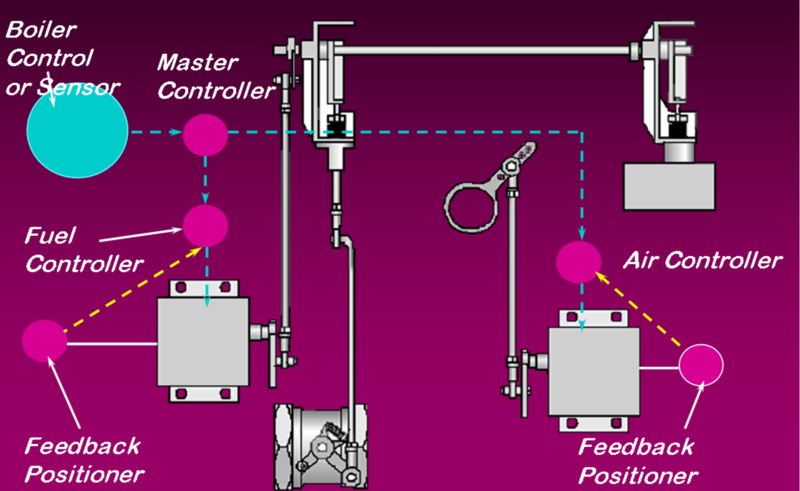 Parallel control systems have separate controllers for the fuel and air. Feedback is provided to ensure that the system is at its predetermined positions. The control scheme uses cross limiting that prevents the feedback of the fuel from being greater than the feedback of the air. This system allows more complex control scheme, especially in a multi-fuel burner like natural gas and diesel fuel. Parallel controls have a more complex control scheme that allows burners to fire multi-fuel at their optimal excess air. Parallel controls give the end user more flexibility in the fuel/air ratio. Parallel controls allow more sophisticated burners can be used (Low NOx, Ultra Low NOx, specialty fuels). Parallel controls cannot compensate for ambient changes in temperature or heating value of the fuel. Fully metered control schemes use fuel flow and airflow transmitters to control the excess air of the burner at all firing rates. This control scheme addresses the shortcomings of the parallel control scheme. Fully metered control schemes use cross limiting to prevent the burner from becoming fuel rich.